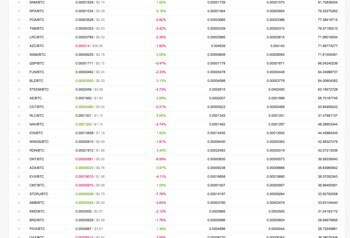 Binance – review. Is it safe to use in 2019? 1 Binance – what is it? 2 How does the Binance cryptocurrency exchange work? 3 What cryptographic currencies does the service support? 4 How to deposit money from one’s account? 5 Fees and commissions – how much do you have to pay for using the service? 6 How does Binance provide security and how does account verification work? Cryptocurrency trading has certainly become very popular nowadays. This is not only the real era of mining cryptocurrencies, but also the growing number of transactions on the exchanges themselves, which from month to month record increasing turnover. There are a lot of different cryptocurrency exchanges on the global market, but unfortunately not all of them offer attractive conditions. Some are simply unpredictable and others introduce very high commissions for transactions, which is not very beneficial for many people. How does Binance look in this context, and is it worth using this exchange? Binance – what is it? The company called Binance, which can be found at the internet address binance.com, is nothing but a cryptocurrency exchange, which, however, in the case of many people may raise some doubts. The exchange is registered in China and has been on the market only since 2017, but it turns out that according to the opinions of its users (whose number is growing from month to month), it is a really safe place to enter into transactions. This exchange supports only cryptocurrencies, so, unfortunately, the fans of fiat money will not find anything interesting here. On the other hand, it is worth mentioning that the company is controlled by QUOINE, a very well-known and strong processor of payments related to cryptocurrencies, which operates in Japan. A certain impediment in transaction processing lies in the fact that the exchange is centralized, and therefore the cash must be located directly on it. On the other hand, Binance boasts really low commissions. Is it really so? 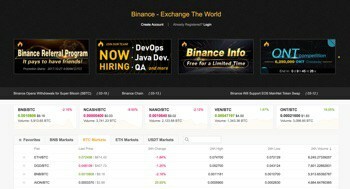 How does the Binance cryptocurrency exchange work? The operation of the cryptocurrency exchange itself is very simple and it does not differ much from the way the well-known Forex exchange functions. In this case, we can conduct purchases or sales of our own cryptocurrencies, for example BTC, which are accepted by the exchange. Through meticulous observation of the exchange rates, one can try to buy currencies for the lowest amount of money, and then sell them with profit when the exchange rate is slightly higher. A fairly well-prepared user interface helps a lot in this matter: it shows with great accuracy the current market data – such as buying and selling rates as well as a lot of other valuable information. What cryptographic currencies does the service support? Interestingly, this exchange also has its own currency: BNB, or Binance Coin. While it may not be very valuable, owning it produces quite attractive implications for the exchange users – more on this subject in a moment. How to deposit money from one’s account? The exchange has definitely made sure that the using its capabilities should be as transparent as possible to the user. This also applies to the matter of deposits and withdrawals of funds stored in the account. To accomplish that, all you have to do is log in to your account and go to the “balances” tab, which shows both deposit and withdrawal options. It is worth remembering here that in the case of a cryptocurrency withdrawal, the service establishes certain minimum amounts that allow for such a transaction. Because the number of supported cryptocurrencies is huge, we recommend you simply review the table with minimum withdrawals, which can be found at binance.com. Fees and commissions – how much do you have to pay for using the service? We have already mentioned that Binance boasts very low commissions on financial transactions, right? It is very important that these assurances are also confirmed by the exchange users, whose number is constantly growing. The commission in this case is constant and always equals 0.1% of every transaction made on the exchange. This is, however, where the BNB currency comes into play, as we mentioned before – that is, Binance Coin. Owning even a small amount is very beneficial. As a result, each transaction will automatically be settled in BNB, which, in turn, allows to reduce the commission to the level of 0.05%. Small commissions are also collected during the withdrawal of cryptocurrencies, but here we again refer you to the table on the exchange’s website, where all these values ​​have been specified in detail. How does Binance provide security and how does account verification work? Thanks to transaction handling by QUOINE, the largest cryptocurrency payment processor in Japan, every exchange user can certainly feel very safe here. It is necessary to remember at the same time that just setting up a user account at the Binance exchange does not allow us full access to its functionality. In the case of unverified accounts, you cannot withdraw more than 2 BTC per day from your balance, but after verification, this limit increases to 100 BTC. The verification process is really simple and consists simply in providing your basic personal information. Regardless of that you should know the risks connected with crypto-currency investments and current regulations. Binance is certainly a very young cryptocurrency market on the market, but its popularity is constantly increasing. Although the Chinese market is not very favorable to cryptocurrencies, the position of the exchange is very strong, mainly because most of its users come from outside China. What is even more important, the vast majority of current users really praises the exchange. Among the positive aspects, they mention not only low commissions and seamless withdrawals, but also a transparent interface, which makes life easier especially for people new on the BTC market. not too bad, I’ve been looking for some reasonable exchange for a while, and I keep finding places where commissions are killing you. Any idea if they have some cool partnership programs? how long more or less do you have to wait for the deposit to be registered in the account so it appears in the virtual wallet??? © Invesir.com 2019 All rights reserved.